Members and guests of the International Association of Scientologists (IAS) from 65 nations descended upon the historic Saint Hill, the home of Scientology Founder L. Ron Hubbard, for an exhilarating weekend that marks the anniversary of a legacy—one born 32 years ago on the grounds of Saint Hill, where the IAS was first formed. Scientologists and guests from 65 nations gathered on Friday evening, October 7, for a celebration heralding 12 months of worldwide impact in the name of the International Association of Scientologists. The grand weekend spanned three days and nights in honor of the IAS legacy, forged in the desire to take a stand for social justice, human rights and a world without war or crime, and tempered in a commitment to guarantee that mankind can attain the total freedom he is striving for. Mr. Miscavige presided over the weekend’s centerpiece event at the 32nd Annual International Association of Scientologists celebration, on Friday eve, October 7. Friday night’s event traversed the panoply of humanitarian accomplishment over the past year, and focused on renowned IAS-sponsored initiatives. SAFEGUARDING CHILDREN IN CATALONIA The Citizens Commission on Human Rights (CCHR) Barcelona paved the way to informed consent and shut the door on mandatory drugging for every child. DEFENDING THE LIBERTY OF PATIENTS In the Ukraine, CCHR permanently protected patient’s rights by establishing that no psychiatric label can deprive basic freedom. INTERNATIONAL HUMAN RIGHTS AWARENESS United for Human Rights held awareness rallies and events in honor of the International Day of Human Rights in more than 100 cities. HUMAN RIGHTS EDUCATION FOR NORTH AFRICA In Morocco, United for Human Rights created an educational network comprising national councils and organizations in the name of securing rights for every faith. A MORALS RESURGENCE IN VENEZUELA On Venezuela’s resort island of Margarita, national police embraced the 21 precepts of The Way to Happiness, distributing 180,000 booklets and thereby effecting a 65 percent drop in serious crime. DRUG EDUCATION TO AMERICA’S FUTURE Drug-Free World provided vital drug education to assist more than 125,000 Boy Scouts to meet the requirements and achieve their Second Class rank. INTERNATIONAL DISASTER RESPONSE In 2016, Scientology Volunteer Ministers answered the call to crisis points of natural disaster all around the world. SCIENTOLOGY VOLUNTEER MINISTER IMPACT IN FIJI The Volunteer Minister South Pacific Tour empowered entire villages in Northeastern Fiji with VM tools on communication, conflict resolution and the alleviation of spiritual trauma. VOLUNTEER MINISTERS PARTNERING WITH THEIR COMMUNITIES Scientology Churches were the nerve centers for Volunteer Minister activity in their local zones. Volunteer Ministers now partner with 1,100 agencies and organizations internationally. During the evening’s celebration, a tour de force presentation of each IAS-sponsored humanitarian program revealed their impact on individual lives—wherever they go, which is everywhere. Further punctuating the night were three stellar examples of Scientologists displaying outstanding humanitarian commitment. Expansion and accomplishment were in the spotlight during a weekend of festivities and fanfare that heralded 12 months of worldwide impact in the name of the International Association of Scientologists. 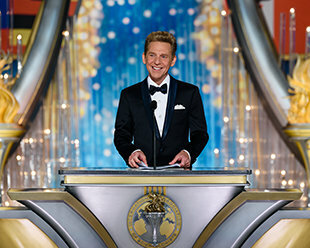 Mr. David Miscavige, presided over the three-hour event before an audience from 65 nations. Under his leadership, the Church has experienced a year of unparalleled expansion. Overnight the Grand Marquee was transformed to host the IAS Patrons Ball. The dazzling black-tie evening is held in recognition of the newest Patrons and their commitment to supporting the humanitarian activities and organizations that are the hallmark of the International Association of Scientologists. On the third and final night, the Saint Hill Charity Concert capped the weekend’s festivities. Some 1,500 local residents attended the annual event which continued a tradition begun by L. Ron Hubbard himself in support of community organizations in East Grinstead. Four local charities were honored throughout the evening of music and dance and awarded vital funding to assist in their community work over the year ahead. CHURCH OF SCIENTOLOGY NATIONAL AFFAIRS OFFICE FOR IRELAND The future Church of Scientology National Affairs Office for Ireland was unveiled at the IAS anniversary celebration. The historic facility is located within the iconic Merrion Square in Dublin and will be committed to the unqualified delivery of Scientology-supported social programs on the Emerald Isle. The July grand opening of the Harlem Church of Scientology and Community Center, located on Harlem’s legendary 125th Street, was fêted during Friday evening’s stirring event. The Church’s year-long expansion efforts were crowned by the grand opening in September of an all-new spiritual headquarters for the Asia Pacific region in Sydney, Australia. Just ten minutes from Sydney’s city center, yet a world away amid 900 acres of arboreal forest in the Lane Cove National Park, stands the stunning new advanced spiritual home of the Church of Scientology.